Leon Kobrin (1872-1946) was a prolific short story writer, novelist, literary critic, and playwright, and a pioneer of Yiddish literature in America. Born in Vitebsk in present-day Belarus, Kobrin was raised with little secular education but was a voracious reader of Russian literature. 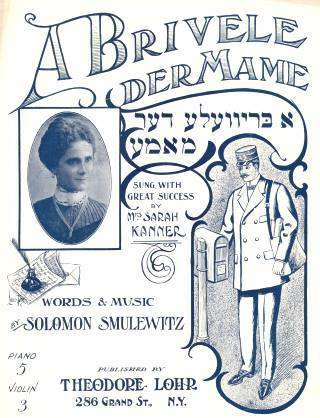 He arrived in America in 1892 and began his Yiddish writing career while working as a shirt maker, cigar maker, and baker in Philadelphia and rural Pennsylvania. 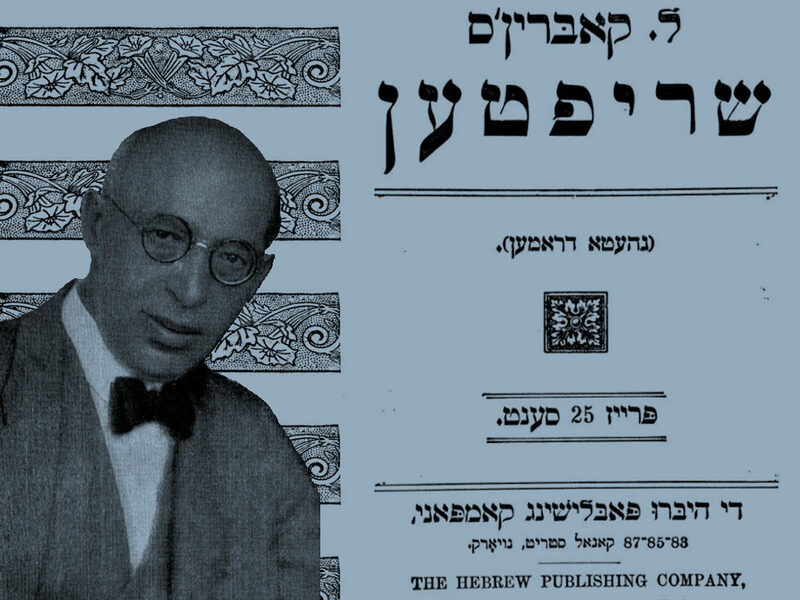 As Kobrin reached greater success in his writing, he settled in New York City and became a regular contributor to several leading Yiddish newspapers including Abend blat, Arbeter tsaytung, Tsukunft, Forverts, Di varhayt, and Der tog. He gained fame as a playwright while working alongside New York Yiddish theater impressario Jacob Gordin, and later as the writer-in-residence for Boris Thomashefsky’s theater company. 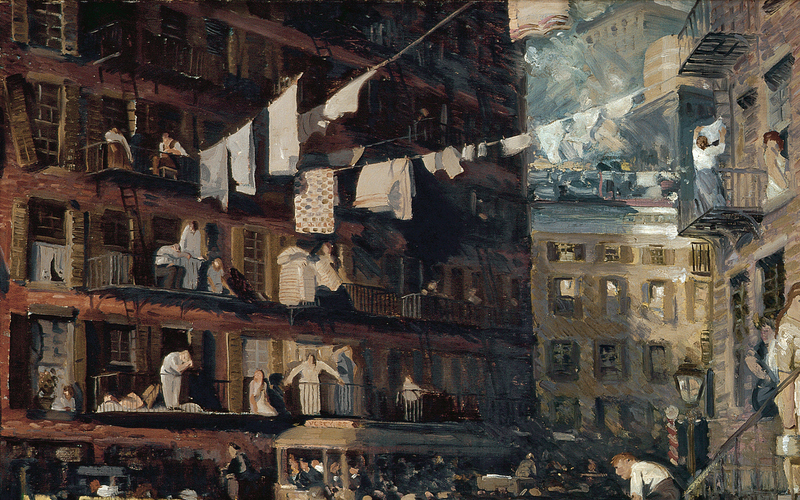 While Kobrin’s writing often contained elements of melodrama, he was known as a realistic writer eager to describe the experience of Jews in America. “Blessed is the True Judge” appeared in Kobrin’s 1903 collection Geto dramen, the first collection of his stories to appear in book form. In the story, a poor, illiterate Jewish widow sells her home to finance her daughter’s journey to America to find a marriage that will bring her wealth. Invoking God’s justice as she sees her daughter off at the railway station, Basha already acknowledges through her use of the traditional formula spoken at a time of death (“barukh dayan emes”) that her daughter’s departure is akin to her ultimate loss. Yet Basha continues to lose her daughter as she lacks control of their relationship, which is mediated through a town scribe who reads Hannaleh’s letters aloud and composes Basha’s responses, and as she becomes increasingly unable to understand her daughter due to a profound and ever widening cultural gap. This culminates in Hannaleh’s final letter, in which she confesses to her mother that she has married a Christian, although she knows that the marriage will cause her mother great pain. She explains, “All human beings are brothers.” 1 1 If this line sounds familiar to readers of Sholem Aleichem’s story “Chava,” that might not be coincidental. Olga Litvak suggests that Kobrin’s story may have served as inspiration for Sholem Aleichem’s better known story from his Tevye cycle. Olga Litvak. “Khave and Her Sisters: Sholem-aleichem and the Lost Girls of 1905.” Jewish Social Studies, vol. 15, no.3, 2009, 1-38. Through this formulation, Hannaleh demonstrates that her newfound socialist universalism has shaped her worldview in such a way that it has become incompatible with her mother’s experience of violence and oppression engendered by religious, national, and racial difference in a town called “Pogromovka.” When her daughter marries a Christian, from Basha’s perspective her downfall is complete. She will be scorned, pitied, and reviled, and her daughter, her most prized possession, will remain far away in the hands of Christians, whom she sees as enemies. Although to Basha, Hannaleh’s marriage is a great tragedy akin to a death, to Hannaleh it is a moment of hope, oriented toward a future in which old prejudices can be eschewed in the great American melting pot. זי איז דאַן שױן געװען אַ זיבעצן־יאָריקע מײדל, בײַ לײַטן אַ כּלה אַ מױד. און פֿאַרדאגהט האָט זיך באַשע: װינד און װײ איז איר, װאָס זאָל זי נעבעך איצט טאָן? קײן חיונה איז ניטאָ, חנהלע איז אַ דערװאַקסענע מױד – װאָס װעט זײַן? װאָס װעט זײַן? און זי האָט זיך גענומען האַלטן עצות מיט חנהלען: חנהלע – טאָכטערקע, װאָס טוט מען? – חנהלע, טאָכטערקע, װאָס רעדסטו, אױ אַ װײטאָג איז מיר, סטײַטש, אין אַמעריקע? און װוּ װעל איך בלײַבן אױף מײַנע עלטערע יאָרן, מיט װעמען, אַ בראָך צו מיר?! – חנהלע, חנהלע, גאָט זאָל מיט דיר זײַן, דער זכות פֿון דײַן פֿרומען טאַטן זאָל דיר בײַשטײן! – האָט געקלאָגט באַשע. חנהלע האָט אױך געװײנט, געװישט מיט אַ װײַסער טיכל אירע שײנע אױגן און ביטער געװײנט. און די װאַגאָנעס טראָגן זיך דערװײַלע מיט אַ הוזשען‏ און זשוזשען אַלץ װײַטער און װײַטער און באַלד פֿאַרשװינדט דער לעצטער װאַגאָן פֿון די אױגן… און באַשע זעט נאָר איצט פֿאַר זיך רױך, רױך און רױך… װײַסן רױך, װאָס עס האָט זיך אָפּגעשטעלט פֿון אַהינטער די װאַגאָנעס, װעלכע זײַנען אַװעקגעפֿלױגן אַזױ האַסטיק מיט איר חנהלען; און אין דעם רױך, דאַכט זיך איר, איז איצט פֿאַרטרונקען זי און די גאַנצע װעלט. ער שטיקט אַזױ, ער עסט אַזױ די אױגן, דעם האַלדז און דאָס האַרץ! When her husband was still living she had little to complain about. Hannaleh wanted for nothing—not clothing, not shoes—everything, thank God, was provided for. Hannaleh also had a tutor so that she could study. In order to succeed these days, one must be educated. Hanneleh had a mind for learning, like a boy. It’s no exaggeration to say she was a prodigy. Her writing was truly exceptional. And her reading, you want to know about her reading? It was unparalleled! Hannaleh truly grew into an impressive figure. You couldn’t find her equal even if you were to search all over in the middle of a sunny day with a lantern lighting your way! She had black eyes like a pair of sparkling diamonds, a face that shone like the sun… and a smile that was pure grace … and her figure? Straight and tall like a sapling! But Hannaleh was suddenly left a poor orphan when her father Moshe surrendered his soul to God. When it happened, she was a seventeen year old girl, and should already have been married. And Basha was deeply troubled: What would she do now? She had no livelihood, and Hannaleh was already a grown young woman! What could she do? What was going happen to her? Basha cried, struggling against the idea, and wept bitterly. How could she bear to be parted from Hannaleh? How could she let such a young child go so far away, to a whole other world that can only be reached by crossing the seas? And once God ensured her a safe passage, what would happen to her when she arrived? She would have no mother, no father, no friends and no family … What sorrow would befall her, and how much heartache would weigh upon her mother! Basha sold her house and was no longer the mistress of her own home. She gave Hannaleh two hundred silver rubles for the journey. With a heart wracked with pain, she rode to the train station with her Hannaleh. “Hannaleh, Hannaleh, God will be with you, and the merit of your pious father will always follow you,” Basha cried. Hannaleh also wept bitterly, wiping her beautiful eyes with a white handkerchief. She boarded the train. Basha remained behind, stricken, as though her heart was being torn asunder. A ring, a whistle, the wheels slowly began to move … Hannaleh thrust her head out of the window of her railcar, with tears running down her cheeks. “Goodbye, Mother,” she wailed, “Goodbye … ” This last word was lost in the noise of the wheels, which started to move faster. White smoke trailed after the locomotive and spread over the railcars that followed. Basha looked at the train and its smoke with teary eyes and it seemed as though something precious had been stolen from her, something that she could not survive without, not even for a minute. It was taken from her and hidden in the train, and the thieves were running away with it, flying away with it in the smoke that floated above the railcars. “Wait! Stop! Help!” she wanted to cry out, “Just let me look at her one more time, the light of my life! Let me just give her one last kiss! She is my only daughter, the apple of my eye, my finest gem—my Hannaleh!” but her voice was caught in her throat, and her lips just quivered in silence. And in the meantime the train chugged farther and farther away and soon the last railcar vanished from sight. All that Basha could see was smoke, smoke, and more smoke. The white smoke trailed behind the railcars as they sped away with her Hannaleh. It seemed to Basha that this smoke would drown the whole world and her together with it. It stuck in her throat, made her eyes water, and reached down into her aching heart. און באַשע האָט געבעטן איר שכן, מאָניע דעם מלמד, אַז ער זאָל אַזױ גוט זײַן און אָנשרײַבן איר חנהלען אַ גוטן בריװ. זי האָט װידער געבעטן מאָניען, ער זאָל חנהלען שרײַבן, און דער גרױסער בעל־מליץ האָט אָנגעשריבן װידער אַזאַ בריװ. – ר׳ מאָניע, האַרציקער, װאָס מײנט זי דאָס? װי שרײַבט זי דאָרטן? – װאָס? פֿלעגט ער פֿרעגן, קנײטשנדיק שטאַרק דעם שטערן. – אָט דאָס: „קעספּלוטאַטע,“ װי שרײַבט זי דאָרטן? – ניט דאָ געדאַכט. פֿאַר קײן ייִדן געדאַכט – פֿלעגט אונטערכאַפּן באַשע – איז װאָס שרײַבט זי פֿאָרט, האַרציקער? – װײ איז מיר, װײ איז מיר, אַזאַ שטילע טײַבעלע געװען!… ר׳ מאָניע, ליובינקער, זעט, פֿאַרדינט אַ מיצװה; האָט רחמנות, מוסרט זי כאָטש אױס מיט גוטן! Oh, what a celebration, what a blessed day it was for Basha! She received her first letter from Hannaleh, saying that she had arrived in New York, and had met other recent immigrants from their town, who had hired her to sew shirts in a factory. Basha asked her neighbor, Monyeh the melamed, to write a letter to Hannaleh for her. And Monyeh, you should know, was not only literate, he was a great writer, with the most sophisticated style. He could make even stones weep with his graceful stylings. Basha would watch his face as he read Hannaleh’s letters out loud, listening with every bone in her body, and struggling to understand, but there was very little that she could understand. “What?” he would ask, wrinkling his forehead. איין באַשע נאָר האָט ניט געװוּסט פֿון דער בשׂורה, זי האָט שױן לאַנג־לאַנג ניט געקראָגן קײן ידיעה פֿון איר חנהלען און זי האָט געװײנט און געקלאָגט נאָך איר. אין די קורצע זומערנעכט פֿלעגט זי זיצן אױפֿן בעט מיט חנהלעס בריװ אין די הענט און פֿאַר דעם זילבערנעם שײַן פֿון דער לבֿנה, װעלכע פֿלעגט אַרײַנקוקן אין פֿענצטערל פֿון איר קאַמער, פֿלעגט זי דורכזען די װײַסינקע, באַשריבענע בײגעלעך פּאַפּיר און כאָטש זי האָט ניט געקענט לעזן, האָט זי געװוּסט דעם אינהאַלט פֿון יעדן בריװ באַזונדער. There was a rumor brewing in Pogromovka, a bit of news that arrived from America. The gossip was passed from mouth to mouth, from house to house, from shul to shul, that Hannaleh, Basha Chaya Gitl’s daughter, married a Gentile. Basha was the only one yet to learn of this news. She had not heard any news from her Hannaleh in a long time, and she cried and longed to hear from her. In the short summer nights, she would sit on her bed with Hannaleh’s letters in her hand and in the silvery light of the moon that glimmered through her bedroom window she would look through the thin sheets of written-on paper, as though she could read them, knowing the contents of each letter by heart. In the evening she would sit on the bench beside her house and wait for the mailman to come and bring a letter from Hannaleh. When she saw the mailman in the distance her heart would begin to pound faster and faster, her arms and legs would begin to shiver and she would eat the mailman up with her starving eyes. When the mailman shook his head no, she felt as if her mind was burning up. Her head would sink into her chest as she remained sitting, fixed in place. און אײן מאָל – פֿאַר נאַכט – װען דער פּאַסטעך האָט געטריבן די בהמות פֿון פֿעלד, װען דער הימל איז אין מיטן געװען קלאָר און טיף בלױ און בײַ די זײַטן אַרומגעלײגט מיט פֿײַערדיקע אוזאָרן, איז געזעסן באַשע אױף דער פּריזבע נעבן הױז און האָט געװאַרט, װי געװײנלעך, אױפֿן בריװטרעגער. פּלוצעם האָט זי אים דערזען און האָט זיך גלײַך אײַנגעגעסן מיט אירע אױגן אין זײַן פּנים. ער האָט זי אַ רוף געטאָן. זי איז צו אים צוגעלאָפֿן, בלײך, װי לײַװנט, און האָט געציטערט מיטן גאַנצן קערפּער. ער האָט איר דערלאַנגט אַ בריװ פֿון אַמעריקע. זי האָט אַ כאַפּ געטאָן זײַן האַנט און האָט פֿון גרױס פֿרײד, װײנענדיק און לאַכנדיק, גענומען זי קושן, װי די האַנט פֿון אַ גוטן מלאך. דאַן האָט זי זיך אַװעקגעלאָזן צו מאָניען. מאָניע – אַ הױכער, דאַרער ייִד, מיט אַ בלײכן, שווינדזיכטיקן פּנים, מיט אַ שפּיציקער קאָלטענעװאַטער בערדל, מיט געלע פּאות, פֿאַרדרײטע אין רינגלעך, מיט אַ פֿאַרשמאָלצענער יאַרמלקע‏ אױפֿן קאָפּ, איז געשטאַנען נעבן טױער פֿון זײַן נידעריקע‏ שטיבל, האָט געהאַלטן אַ פּאָלע פֿון זײַן זשופּיצע‏ בײַ בײדע ברעגעס און געמאַניעט צו זיך זײַן װײַסע ציג, װעלכע איז געשטאַנען אין מיטן גאַס, האָט געקוקט אױף אים מיט אירע נאַרישע אױגן און געדרײט מיטן װײדל. – דזשיק, דזשיק, דזשיק! האָט ער זי גערופֿן אײַנבייגנדיק נידעריק‏ צו דער ערד די פּאָלע. – ר׳ מאָניע, ר׳ מאָניע, עס איז דאָ אַ גאָט אױף דער װעלט, – איז צו אים צוגעלאָפֿן באַשע מיט אַ געשרײ, – אַ בריװ פֿון אַמעריקע, פֿון חנהלען באַקומען… עס איז דאָ אַ גאָט, דאָ! – ר׳ מאָניע, האָט רחמנות, איך שטאַ־אַרב! – װײַזט מיר אַ קוק טאָן. ער האָט גענומען דעם בריװ און האָט אים אָנגעפֿאַנגען צו באַטראַכטן פֿון אַלע זײַטן. – װאָס קען זי שרײַבן? – האָט ער אױסגערעדט פֿאַר זיך אונטער דער נאָז. – האָט רחמנות, ר׳ מאָניע, טײַערינקער. קומט אַרײַן צו מיר אין שטוב און לײענט מיר איבער. – כ׳לעבן, באַשע, איר װאָלט געבעטן אַן אַנדערן. קעגן אַזאַ קאָמפּלימענט קען אונדזער בעל־מליץ ניט אײַנשטײן. – װײס איך, קומט, זאָגט ער. זײ זײַנען אַרײַן אין שטוב. מאָניע האָט געעפֿנט דעם בריװ. באַשע האָט זיך געשטעלט קעגן אים, האָט אונטערגעשפּאַרט מיט אײן האַנט דעם קינבאַק און האָט זיך אײַנגעגעסן מיט אומגעדולדיקע אױגן אין זײַן פּנים. – איך קען ניט – האָט מאָניע אױסגעשריִען – אַ מיתה־משונה זאָל זי דאָרטן אײַננעמען! – חתונה?… חנהלע האָט חתונה געהאַט?! װעמען שילט איר, ר׳ מאָניע?! האָט זי אױסגעשריִען צעמישט. באַשע איז געװאָרן בלײך, װי דער טױט, און האָט גענומען ציטערן. זי האָט שװער געאָטעמט און האָט געציטערט מיטן גאַנצן קערפּער. – װאָס זאָל איך לײענען, די גאַנצע שטאָט װײס עס אָן איר בריװ – האָט געזאָגט מאָניע. און זאָגנדיק עס, האָט זי זיך דערשראָקן פֿאַר אירע אײגענע װערטער. „װאָס רעד איך רבנו־של־עולם?“ האָט זי געטראַכט צעמישט און האָט זיך געטרייסלט מיטן גאַנצן קערפּער. מאָניע האָט געענטפֿערט אױף איר פֿראַגע מיט אַ מאַך מיטן קאָפּ. מאָניע האָט אַ קװעטש געטאָן מיט די פּלײצעס און האָט אַ זיפֿץ געטאָן. זי האָט זיך צוגעהערט צו זײַנע רײד, צעטומלט, מיט אױסגעגלאָצטע אױגן און מיט אַן אָפֿענעם מױל, האָט פֿאַרבראָכן די הענט, האָט שטאַרק גענומען מאַכן מיט די ברעמען און האָט אַראָפּגעלאָזן דעם קאָפּ. אַזױ איז זי געשטאַנען אַ קורצע װײַלע. דאַן האָט זי װידער אױפֿגעהויבן דעם קאָפּ, האָט גענומען קוקן מיט בלישטשענדיקע אױגן אױף מאָניען און שמײכלען. And once, one evening while the herdsman led the cattle back from the field, and the sky was clear and deep blue, edged with fiery patterns of sunset, Basha sat on the bench beside her house and waited, as usual, for the mailman. As soon as she saw him she gobbled him up with her eyes. He called out to her, and she ran to him, pale as white linen, her whole body quivering. He handed her a letter from America. She grabbed his hand and crying and laughing with joy, she kissed it like the hand of a benevolent angel. Then, she ran to Monyeh. Monyeh was a lanky Jew whose face was haggard from tuberculosis. He had a matted, pointy little beard and yellowing peyes curled into ringlets, and a greasy yarmulke on his head. He stood by the doorframe of his small home, holding the coattails of his long, coarse overcoat by the edges and beckoning to his white goat that stood in the middle of the road, looking at him with foolish eyes and wagging his tail. “Come here, you!” he called out, lowering his coat toward the ground. “M-m-m-ehhh!” cried the goat, shaking its stubby tail, and it didn’t budge. He took the letter and examined it from all angles. “What could she have written?” he whispered under his breath. The great learned man could not withstand such a compliment. “What can I do? Come … ” he said. They entered the house. Monyeh opened the letter. Basha stood across from him, one hand supporting her chin, and impatiently devoured his face with her eyes. “Marriage? Hannaleh is married? Who are you cursing, Reb Monyeh?” cried out Basha in confusion. She pulled on his sleeve and stared at him, wide-eyed. “Read or I will claw your eyes out!” She breathed heavily and her whole body shook. “Why must I read it out loud? The whole town knows it, even without her letter,” Monyeh said. “What are you saying? Speak! Hannaleh has not converted to Christianity, has she?” And as she said this she grew suddenly fearful of her own words. “What am I saying, Master of the Universe?” she thought to herself, confused, quivering. Monyeh answered her question by nodding his head, silently. Monyeh shrugged his shoulders and sighed. “Basha,” he said with feeling, “What do you mean, I am torturing you? Anyone who wants to hurt you should himself be tortured… Of course I have pity for you, I have deep pity … believe me, all of this has taken a toll on my health too … For Hannaleh was like a daughter to me as well, and it is terrible that she should do such a thing … ” He lowered his head and sighed. She listened to his words with conflicting emotions. With staring eyes and mouth agape, she wrung her hands, her eyebrows furrowed, and her head sunk to her chest. She remained like this for a long time. Then she lifted her head, looked through teary eyes at Monyeh and smiled. “Read,” she said in a choked voice, between clenched teeth, “read more!” She grabbed onto his sleeve and tugged at it. זי איז אַנטשװיגן געװאָרן און האָט נידעריק אַראָפּגעלאָזן דעם קאָפּ. פּלוצעם האָט זי זיך צעלאַכט מיט אַ שטילן, מערקווירדיקן געלעכטער, ציטערנדיק מיטן גאַנצן קערפּער, װי אַ בלאַט. – גאָט, דו ביסט גערעכט, און דײַן מישפּט איז גערעכט! און זי האָט װידער אַראָפּגעלאָזן דעם קאָפּ. If this line sounds familiar to readers of Sholem Aleichem’s story “Chava,” that might not be coincidental. Olga Litvak suggests that Kobrin’s story may have served as inspiration for Sholem Aleichem’s better known story from his Tevye cycle. Olga Litvak. 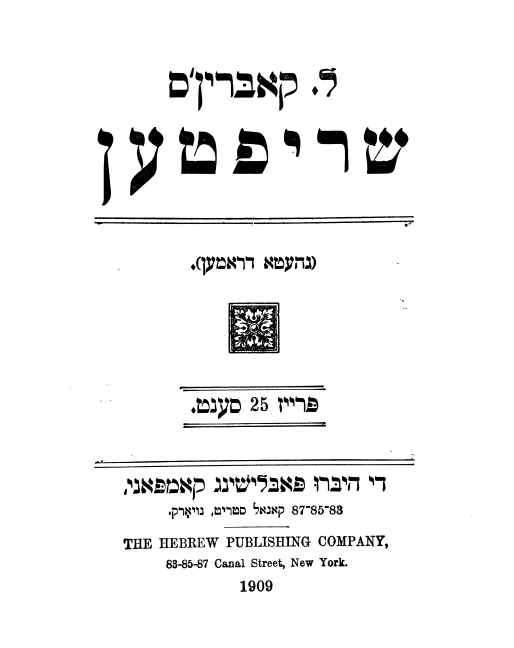 “Khave and Her Sisters: Sholem-aleichem and the Lost Girls of 1905.” Jewish Social Studies, vol. 15, no.3, 2009, 1-38. Kobrin, Leon. “Blessed is the True Judge.” In geveb, May 2018: Trans. Jessica Kirzane. https://ingeveb.org/texts-and-translations/blessed-is-the-true-judge. Kobrin, Leon. “Blessed is the True Judge.” Translated by Jessica Kirzane. In geveb (May 2018): Accessed Apr 22, 2019. Jessica Kirzane is a Lecturer in Yiddish at the University of Chicago. She holds a PhD in Yiddish Studies from Columbia University. 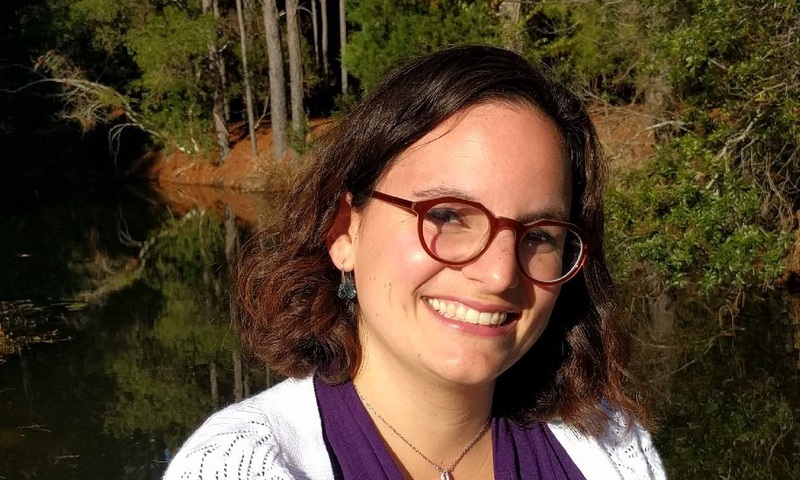 Jessica is the Editor-in-Chief for In Geveb: A Journal of Yiddish Studies. A sweatshop worker finds temporary respite from reality at a relative’s wedding.